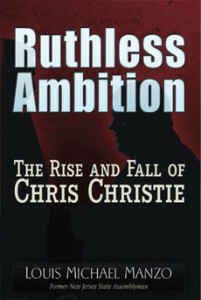 Ruthless Ambition: The Rise and Fall of Chris Christie. In his searing tell-all, Ruthless Ambition: The Rise and Fall of Chris Christie, former New Jersey State Assemblyman Lou Manzo recounts an extraordinary tale of political ruthlessness, corruption, and greed while also telling the story of how he was caught in the center of one of the most egregious political scandals in modern-day history: the Bid Rig III sting operation, masterminded by the then United States Attorney for the District of New Jersey and soon-to-be Governor Christie. Louis Manzo shows us how the blind ambitions of Chris Christie and his staff centered on capturing a governorship and the patronage jobs that accompany it, then parlaying that office into a shot at the presidency. 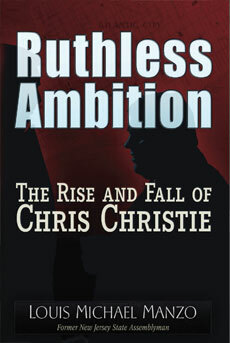 Ruthless Ambition, indeed. Meticulous in backing up everything he says with objective legal documentation in Ruthless Ambition, Louis Manzo makes a convincing case for the governor as an unbridled and sinister politician who made the most of a seriously flawed Department of Justice and overall judicial system to feed his megalomania and desire for power. The book is a must-read for anyone interested in justice and ethical leadership. It can’t happen here? Well, it almost did. Soon you will know why. Philosopher George Santayana said, “Those who cannot remember the past are condemned to repeat it.” Substitute “understand history” and you can appreciate how Manzo’s courageous true tale is poised to help all of us better understand the seemingly incomprehensible.